Just wanted to inform you that Lilly of the West is currently recording a new album. It will be ready in March 2011. The repertoire is country & swing from the 1930s-40s. That’s why we did a 'retro photoshoot'. You may see some funny photos here. Lilly of the West has had a constant lineup for the past two years, featuring Lilly Drumeva (vocal, guitar, fiddle! 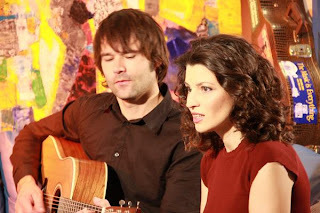 - I’m getting better and play on many songs), Yasen Vasilev (vocal, guitar), Misho Shishkov (Dobro, harmonica, piano, vocals), Body Bozduganova (upright bass, vocals). For a few days I'm back from a very nice singers/songwriters festival in Lithuania called TAI-AS ('This is me'). I had a great time there, met some old faces, and made new friends. I can recommend this festival to everybody who likes to listen to good songs. If you have any news items, concert dates, feature articles, or anything relevant to the next issue of Bluegrass Europe (#77: December 2010/January 2011), please e-mail it to me by 10 November 2010 - thanks! Two more issues of Bluegrass Europe are due to appear under Paolo's editorship. 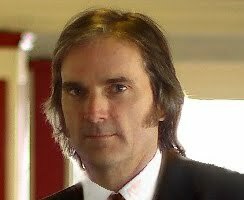 He will retire as editor after issue #78 (February/March 2011), making a total of thirteen years in the editorial chair. An outline of the proposed future for the magazine after that date was published on the European Bluegrass Blog on 10 August. London Old-Time and Bluegrass Music Week 2011 will be from Thursday 5 to Wednesday 11 May. Events will take place all over Greater London, and will include concerts, music clubs, restaurants and bars, barn-dances, jam sessions, Sacred Harp shape-note singing, Appalachian clogging displays, workshops etc. Most of London’s great bands and artistes will be performing – see details of all the events here. Any bluegrass or old-time performers wishing to appear should contact me by e-mail for a list of venues to approach. Visitors to London during the week will be able to find an up-to-date programme on the website, and printed schedules will be available shortly beforehand. The Owensboro-Daviess County Convention & Visitors Bureau, one of the promoters of the Bill Monroe 100th Birthday Celebration being organized to honor the legendary inventor of bluegrass music, launched their official web site today: billmonroe100birthday.com. Bill Monroe, the "Father of Bluegrass Music," would have been 100 years old in September 2011. As many of you know, Monroe's life and legacy will be commemorated with the Bill Monroe 100th Birthday Celebration, a series of festivals and various events taking place throughout the year in and around Owensboro, Kentucky. The new web site is a comprehensive guide to the centennial celebration of Bill Monroe's life. It lists numerous events, some written history and little known facts about Bill Monroe, a biographical timeline, list of awards, photos, maps, links to the International Bluegrass Music Museum and the Monroe Home Place in Rosine, KY where many of the centennial events will take place and more. One of the major highlights will be the Bill Monroe Birthday Party on the Lawn. It will take place on Monroe's birth date - September 13 - at the restored Monroe Home Place in Rosine, Ky. The original house where Bill Monroe was born. Details and links to performers' websites are also on the Festival MySpace site. 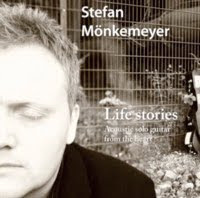 The original Bluegrass Blog published yesterday a post on German acoustic fingerstyle guitarist Stefan Mönkemeyer (also on MySpace), who has just released his new CD Life stories: acoustic solo guitar from the heart. He has recorded two previous albums and an instructional DVD for fingerstyle guitar. The new album is available from Mail Order Music of Berlin. The organising committee of the European World of Bluegrass (EWOB) Festival - held every year in Voorthuizen, the Netherlands - invites all bands playing bluegrass and bluegrass-related music to send in their applications to take part in next year's Festival (2-4 June 2011). The firm deadline for applications is 1 December 2010. * Your band can compete for the European Bluegrass Band Awards and the EWOB Audience Popularity Awards! 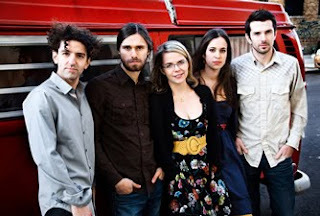 * European bluegrass bands perform alongside great touring bands from the USA & Canada. 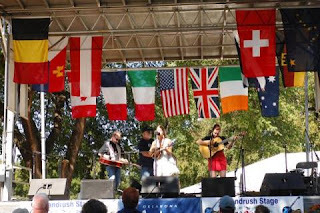 * Showcase your band for European bluegrass festival & concert organizers, agents, managers, radio DJs, & music press - a great investment in your band's future. 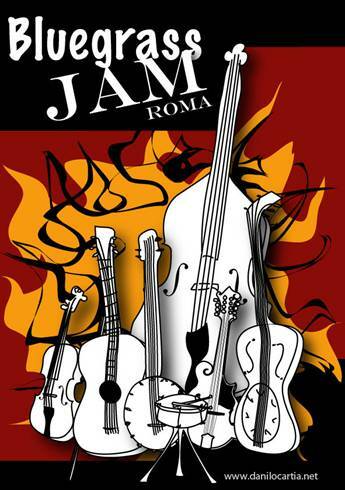 * Meet & jam with wonderful musicians from around the world! * Take part in the excellent EWOB workshops - a virtual bluegrass music school at every EWOB Festival! You can also become an EWOB Member or professional sponsor. 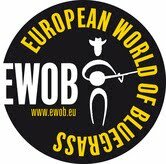 Full details, with links to the band application pages of the EWOB Festival website and more information, are given on the EWOB committee's press release here. ... if you want to take music lessons on just about any instrument, we are here to help. Those of you in the Nashville area who choose to take private lessons will get the benefit of a monthly group jam, led by us! Those of you in other parts of the world can take lessons online, right from the comfort of your own home. Here's the deal. You can access each of us through our individual websites or through our joint site. 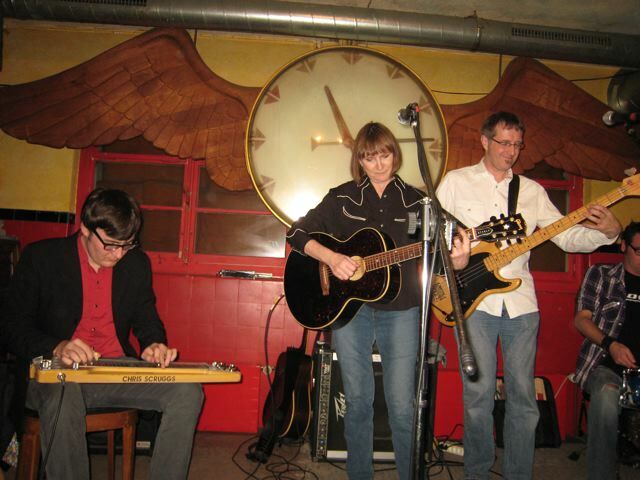 Ned teaches banjo, Megan teaches fiddle, and Stephen teaches guitar, mandolin, and voice. Don't worry, we welcome all levels and all ages. We love all kinds of music and teach most of 'em. If there's an instrument or musical genre you can't live without but we don't teach, never fear. We have a group of highly recommended instructors to which we can connect you. Wed. 9 Feb. South Holland Centre, Spalding, Lincs. Uri Kohen of Electric Cave Production has announced the programme for the fifth annual Westport Folk & Bluegrass Festival, which will be held in Westport, Co. Mayo, in the west of Ireland, on 24-26 June 2011. The main venue will be the Wyatt Hotel, where a special offer should be available for accommodation. A new website for the festival should be live by January 2011, and more details will be made available. To mark the fifth festival a strong lineup has been drawn up, with eleven groups headed by A Band Like Alice (UK), Tim Rogers & the Clew Bay Critters (USA/IRL), and the Dust Busters (USA), as well as three other US acts and four from Ireland. The programme also features workshops, sessions, and pub gigs. Tickets for the main event will remain priced at €15. 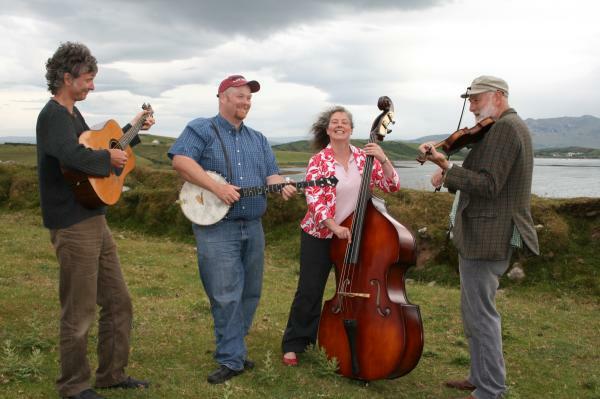 Geraghty's pub in Westport will continue to hold folk and bluegrass gigs between now and the festival. 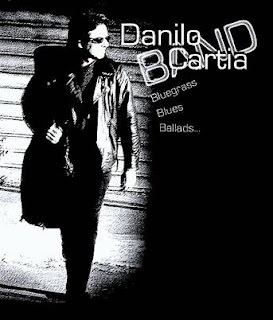 Banjoist, guitarist, and bandleader Danilo Cartia (I) will be among the many artists taking part in the seventh Townes Van Zandt Italian Tribute, which will be held at the Teatro dell' Oratoria, Figino Serenza (CO), Italy, on Saturday 30 October, beginning at 9.00 p.m. Full details, in Italian, are on the event's MySpace page. The programme has now been published for next year's multi-genre, multinational Celtic Connections festival, which will be held from 13 to 30 Jan. 2011 in Glasgow, Scotland. Bluegrass and bluegrass-related acts on the immense programme include the Alison Brown Quartet, Russ Barenberg, Crooked Still, Jerry Douglas, the Fox Hunt, Furnace Mountain, the Henry Girls, Joy Kills Sorrow, Marty Stuart & his Fabulous Superlatives, Alison Moorer, the New Rope String Band, Tim & Mollie O'Brien, Dirk Powell, the Quebe Sisters Band, and the Wilders. Full details, including online ticket sales, are on the Festival website. It turns out that the Bühl area with my home town Offenburg, 35 km south of Bühl, and our Alsatian neighbors in France just across the River Rhine, have an excellent and fertile ground for bluegrass. Just last week, 13 October, the Wilders played Offenburg and (as expected) the Music Hall 'Salmen' was sold out and over two-thirds of the audience came from Alsace. And what a great night, with standing ovations and lots of encores. Now on 18 December, the second Bluegrass Jamboree (with three bands) will play Offenburg with Michael Cleveland and his band as the headliner. This surely will be another sold-out event. 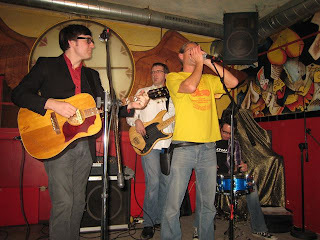 Walter also strongly recommends two home-grown bands from Alsace who are performing locally in the near future. 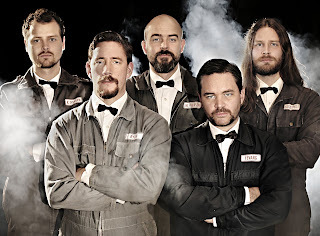 The Mart O' Pickers (left: 'two Americans, three Alsatians, and one Burgundian') will be playing at the 17th-century Carthusian monastery of Molsheim, 25 km west of Strasbourg. The show starts at 20:30 on Friday 5 November, as part of the Vendredis de la Chartreuse concert series. Admission is €8; for info and reservations 'phone +33 6 47 72 41 4 or use this link. Two weeks later (Saturday 20 November) a bluegrass concert will be given at 20:00 in the Salle des Fêtes at Thal- Marmoutier by Serge Rieger (guitar, vocals), Virgil Rieger (bass, vocals), Théo Sauer (banjo, Dobro), and Joel Espesset (mandolin, bass), under the auspices of the Association Gestionnaire de la Salle des Fêtes. Admission is €10 (€5 for ages 8-14); tickets are available at the mairie in Thal (Mon. and Thurs. 18:00-20:00), and at other places on the concert date. A collaboration between Swedish hillbilly bluegrass band the Rockridge Brothers and vocalist Karla-Therese Kjellvander (above) has resulted in the album Dance, Monster, to my soft song!, released on 8 September 2010. It has been well received by critics and audience alike, and the band are now planning their tour schedule for next year. More about this grouping of artists, including bios and performance videos, can be seen on their combined website and MySpace. Paolo Dettwiler, organiser of the Spring Bluegrass Festival in Willisau, Switzerland, announces that he has signed Ila Auto (above) to appear at the 2011 Willisau festival on 28 May 2011. 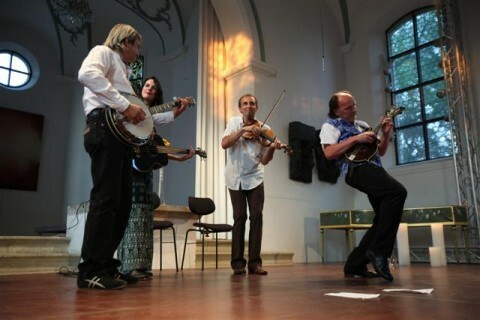 This is believed to be the first engagement for a Norwegian bluegrass band in Switzerland. The band will be flying to Switzerland exclusively for their Willisau appearance, and returning to Norway directly afterwards. Thanks to Petr Hruby of All Bells & Whistles (CZ) for news of the 15th annual bluegrass workshop presented by Petr Brandejs and Jindra Hylmar in Malé Svatoňovice on 15-17 October 2010 (see the EBB for 9 Oct. 2010). The workshop was fully booked by early September, with over 140 students being tutored by 15 instructors on the usual bluegrass instruments, plus bass guitar, mouth organ, and old-time banjo. Attenders could also have their instruments serviced by leading instrument makers: Rosťa Čapek, Jaroslav Průcha, and Jan Fišer. Petr's full report is expected to appear in Bluegrass Europe magazine. 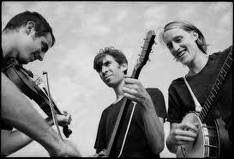 Bluegrass in Belgium announces that on Saturday 23 October the Sons of Navarone will be playing at De Kam, Beekstraat 172, 1970 Wezembeek-Oppem, near Brussels, Belgium. The show starts at 20:00. Sharon Cort, who has toured twice in Europe this year, will kick off the official release of her second release in ten years, the celebrated Country Café, on 15 November at 12th & Porter’s Lounge in Nashville, Tennessee. 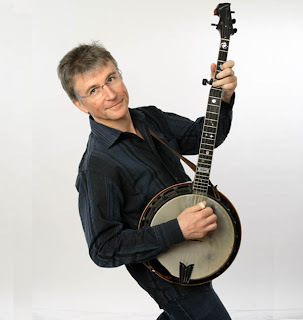 Performing along with Sharon are Aaron Till on fiddle, Ernie Sykes on bass, and Justin Clark on mandolin (all featured on the recordings), with the addition of Larry Perkins on banjo. This is the first reunion of the band since Ernie Sykes moved to New York in 2007. Aaron Till and Justin Clark, celebrated musicians in their own right, are both featured on Jim Lauderdale’s Grammy-winning Bluegrass diaries, while Perkins contributed to the 'Down from the Mountain' tour as well as the PBS special 'The Carter Family - an American family experience'. The night will also feature Barbara Lamb, formerly of Asleep at the Wheel, performing solo from her own new CD release, Twisty girl. Tomorrow Crooked Still (USA) begin a tour of Britain and Ireland lasting till the end of October. They will be playing eight shows in England, one in Scotland, and one at the Sligo Live Sessions in Ireland, where they will appear with the 'progressive-traditional' Alan Kelly Quartet. Full details of the tour are on their own website, together with details of their latest CD, Some strange country. The Danilo Cartia Band (I) sends the following schedule of its appearances in Rome, including the Rome Bluegrass Jam, over the next three months. All these events begin at 22:00. 'Hot Country' is the biggest country music show on TV, now in its 53rd week and with a weekly audience of 431,000 viewers and growing. Broadcast times on Showcase TV, Sky 201, Sky 216, Freesat 403, and Free to view are Sunday and Monday 8.00-9.00 p.m., Tuesday and Saturday 2.00-3.00 p.m.
'Hot Country' is the perfect platform to promote your business or service at unbelievable TV rates; just give us a call on +353 21 4504841 or +353 87 6859895 for full details. You will get results from any promotion you do. We will have four shows up at any one time, starting this weekend. The weekly promotional adverts will also run as a separate section; this will make it very easy for viewers who might like to see what promotions are running for that week. Bands, solo artists: would you like to feature on 'Hot Country' but you don't have a video? Just call us and we will make one for you at a very reasonable cost. Get your music showcased all over Europe on 'Hot Country'. Charlie Louvin, one of country music's living legends, is at present fighting pancreatic cancer. Many of the songs recorded by him and his brother Ira in the 1950s and 1960s have passed into the repertoire of bluegrass artists. As a result, the bluegrass community is giving him strong support at this critical time. Details of concerts and other activities in his benefit can be read here. See also this item on the original Bluegrass Blog. A leading role is being taken by Valerie Smith & Liberty Pike, who are well known to bluegrass fans in Europe from several tours in recent years; they are scheduled to visit Europe again in May 2011. 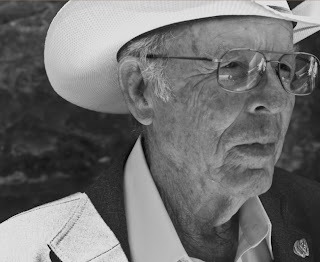 Charlie Louvin, like his near contemporary Dr Ralph Stanley, has never stopped performing and recording, and a new CD by him is due for release next month. The photo on the left, taken a couple of years ago in New York, shows him with Vincent Cross, an expatriate member of the Irish bluegrass scene. Thanks to the 14 October 2010 issue of the Country France e-newsletter for the news that bluegrass receives several mentions in the current issue of the French-language Country Web Bulletin. The 37 pages of this issue can be read online or printed. The three-and-a-half-page feature by Alain Sanders on this year's Festival de Musique Country Rendez-Vous de Craponne sur Arzon reports with approval the performances by the Grascals and by Dale Ann Bradley, Steve Gulley, and the Fox Family. Another item, 'L’histoire du Goree All Girl String Band', by Gérard Vieules, tells the story (with picture) of the eight inmates at a Texas prison in the 1940s who formed a string band, but finished their sentences without recording. A film about them is said to be in preparation, starring Jennifer Aniston. The Bulletin's table of contents also includes 'La Roche Bluegrass Festival', by Eric 'Cactus' Coste. 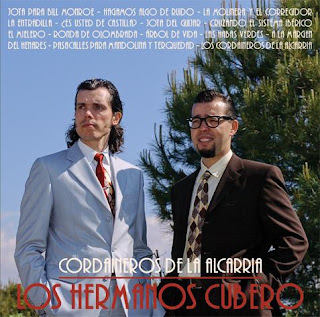 Now available on CDBaby: Cordaineros de La Alcarria, the first CD from Los Hermanos Cubero. Traditional music from Spain with a Bill Monroe flavour, awarded with the European Award of New Creation of Folklore 'Agapito Marazuela' 2010. Here's some links in Spanish. First, the news of the award as it appeared in El Adelantado and El Mundo. Second place, a review of the album at the prestigious Spanish website Tierrafolk.com. Musician, author, and journalist Sid Griffin, leader of the Coal Porters band (UK), was interviewed at the Country Music Hall of Fame and Museum in Nashville, TN, on Saturday 11 September, as part of the last day of the Americana Music Festival and Conference (8-11 Sept.) held at the Hall of Fame in partnership with the Americana Music Association. The full interview can be seen on video on the Sid Griffin website, or as a YouTube playlist. Thanks to Rainer Zellner of the Music Contact agency for the news that a video trailer for this year's Bluegrass Jamboree! Festival of Bluegrass and Americana Music can now be seen online. Nearly twelve minutes long, the trailer features two numbers by each of the groups taking part in this unique 'touring bluegrass festival' - Michael Cleveland & Flamekeeper (USA), Jeff and Vida (USA), and Shotgun Party (USA) - and introduces the individual members. A complete tour schedule is also given. The trailer can be seen on YouTube (where it is the latest of the thirty-nine videos on Rainer's own YouTube channel) or by a link from the Bluegrass Jamboree! website. In 2011, the bluegrass world will lose a historic publication as we say farewell to the Dutch bluegrass music magazine Strictly Country. Rienk Janssen, having published SC magazine for the past 40 years, is hanging-up his editorial hat. The final SC edition will be issue #240 in February. A farewell festival, jam sessions and more is in the planning stages as SC magazine "goes out in style". It will take place on May 6 & 7, 2011 at the Muzeval in Emmen, NL. Performers are invited to sign-up for a stage time slot in advance. The organizers are offering to pay minimal travel expenses. Vendors of music related materials are welcomed for a minimal fee. More details will be announced as the event develops. Follow the progress at strictlycountry.nl in the coming months. Mark the dates in your calendar and help the magazine retire on a happy bluegrass note! Thanks to Laurent Eckhout of the Picnic Festival at Namur, Belgium, for these two photos from this year's event (3-5 September 2010): above, 4 Wheel Drive (D/NL/BE) with Jolanda Peters; below, Hannah and Sophia Johnson of the Toy Hearts (UK). A report on the Festival is expected to appear in Bluegrass Europe. The Toy Hearts (UK) have just issued an e-newsletter to announce their new CD Femme fatale (read about the limited-edition box set), which will be officially released on 18 October. 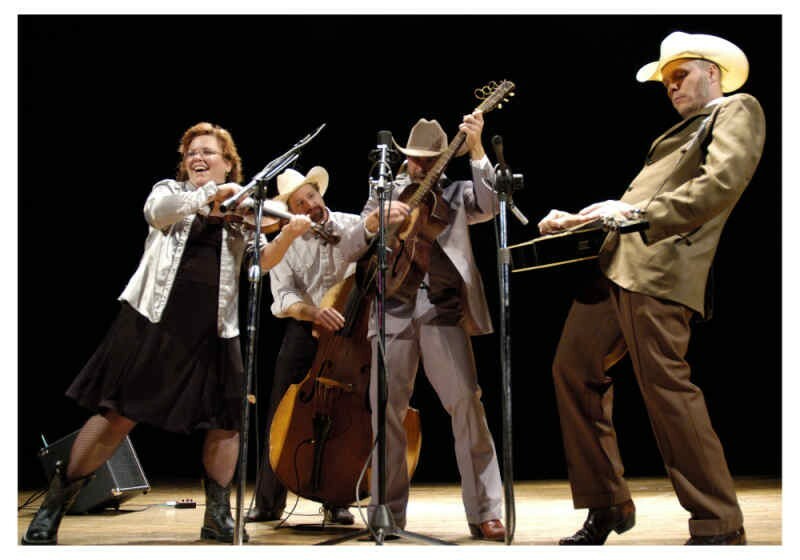 The band will also be opening for the US Western Swing trio, the Hot Club of Cowtown (USA), on six dates of the Hot Club's tour in Britain beginning on 20 October. The Toy Hearts have just returned from a two-week tour in Texas, Tennessee, and Oklahoma - the photo above shows them on stage at the 14th Oklahoma International Bluegrass Festival in Guthrie. Read Hannah Johnson's day-by-day blog of the tour on the Toy Hearts website. The record attendance of 14 instructors with about 140 students is expected this year at the 15th annual bluegrass workshop presented by Petr Brandejs and Jindra Hylmar in Male Svatonovice, Czech Republic. The Friday night show with all the instructors can be watched online on Střižna.cz on Saturday 16 October at 19:00. The photo above shows instructors and students at the 2009 workshop. Other photos from previous events can be seen here. 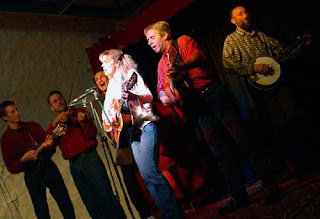 Gail Davies (USA) is a country artist who appeals to many bluegrass enthusiasts, so thanks to Lilly Pavlak for photos of a recent concert by Gail Davies and her band at Dolder 2, Feuerthaler, Switzerland. The above photo shows Gail at centre stage with her son Chris Scruggs (left) and husband Rob Price (right). More photos from the concert can be seen here. On 28 June 2010 three members of Blue Railroad Train (F) - Thierry Lecoq, Sharon Lombardi, and Jean-Marie Redon - joined the internationally renowned violinist Gilles Apap in concert at the Künstlerhaus Boswil in Switzerland. This unique cultural centre is focused on the concert hall, a former church with outstanding acoustics which is often used for recording classical music. The BRT members were invited by Gilles Apap to join him in the Boswiler Sommer festival, as part of a programme that included the Rastrelli Cello Quartet from Russia. Jean-Marie and Sharon report on their website that the classical-music audience gave the bluegrass part of the show a triumphal reception - as they had observed on their previous performances with Apap, one of which was featured on the European Bluegrass Blog on 3 April 2009. Check out if you like an interview I did for Bulgarian TV and internet music channel Music Space TV. I know maybe it’s hard to understand, but the clip, featuring Jakub Racek (Monogram), is nice. The clip, nearly five minutes long, shows the interview intercut with footage from the video of the song 'If I needed you', which Lilly recorded with Jakub Racek of Monogram (shown in photo above). Thanks also to Erio Meili of Brazil for the news that this clip has been chosen as 'Video of the Month' by the Sao Paulo Bluegrass Music Association. 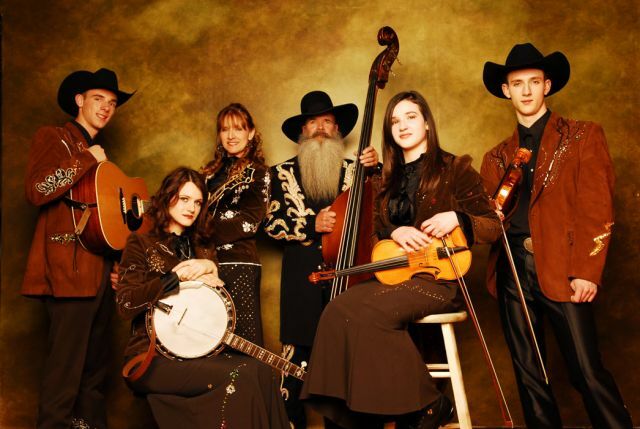 Thanks to UKBluegrass.com for the news that the dynamic family band Cherryholmes (USA) will be playing in Wales this month, between 11 and 17 October. 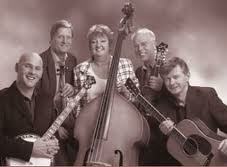 Cherryholmes, who won the IBMA Entertainer of the Year award in 2005, have a powerful stage presence. Their full schedule in Wales (the only dates they appear to be playing on this side of the Atlantic during this tour) can be seen on their website.